This article is about the firearm cartridge. For the Japanese heavy metal band, see 44 Magnum (band). The .44 Remington Magnum, or simply .44 Magnum (10.9×33mmR), and frequently .44 Mag, is a rimmed, large-bore cartridge originally designed for revolvers. After its introduction, it was quickly adopted for carbines and rifles. Despite the ".44" designation, guns chambered for the .44 Magnum round, and its parent, the .44 Special, use 0.429 in (10.9 mm) diameter bullets. The .44 Magnum is based on a lengthened .44 Special case, loaded to higher pressures for greater velocity (and thus, energy). The .44 Magnum has since been eclipsed in power by the .454 Casull, and most recently by the .460 S&W Magnum and .500 S&W Magnum, among others; nevertheless, it has remained one of the most popular commercial large-bore magnum cartridges. When loaded to its maximum and with heavy, deeply penetrating bullets, the .44 Magnum cartridge is suitable for short-range hunting of all North American game—though at the cost of heavy recoil and muzzle flash when fired in handguns, less so in carbines and rifles. The .44 Magnum cartridge was the end result of years of tuned handloading of the .44 Special. The .44 Special, and other large-bore handgun cartridges, were being loaded with heavy bullets, pushed at higher than normal velocities for better hunting performance. One of these handloaders was Elmer Keith, a writer and outdoorsman of the 20th century. Keith settled on the .44 Special cartridge as the basis for his experimentation, rather than the larger .45 Colt. At the time, the selection of .44 caliber projectiles for handloaders was more varied, and the .44 Special's brass was thicker and stronger than the dated .45 Colt case. Also, the .44 Special case was smaller in diameter than the .45 Colt case. In revolvers of the same cylinder size, this meant that the .44 caliber revolvers had thicker, and thus stronger, cylinder walls than the .45. This allowed higher pressures to be used with less risk of a burst cylinder. Keith encouraged Smith & Wesson and Remington to produce a commercial version of this new high-pressure loading, and revolvers chambered for it. Smith & Wesson's first .44 Magnum revolver, the Model 29, was built on December 15, 1955, and the gun was announced to the public on January 19, 1956 for a price of USD$140. Julian Hatcher (technical editor of American Rifleman) and Keith received two of the first production models. Hatcher's review of the new Smith & Wesson revolver and the .44 Magnum cartridge appeared in the March, 1956 issue of the magazine. Smith & Wesson produced 3,100 of these revolvers in 1956. By the summer of 1956, Sturm, Ruger became aware of this project and began work on a single action Blackhawk revolver for the new .44 Magnum cartridge. A popular rumor says a Ruger employee found a cartridge case marked ".44 Remington Magnum" and took it to Bill Ruger, while another says a Remington employee provided Ruger with early samples of the ammunition. Ruger began shipping their new revolver in late November, 1956. 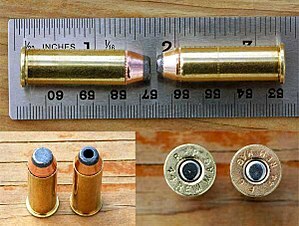 The .44 Magnum case is slightly longer than the .44 Special case, not to make more room for propellant, but to prevent the far higher pressure cartridge from being chambered in older, weaker .44 Special firearms, thus preventing injuries and possible deaths. The .44 Magnum was an immediate success, and the direct descendants of the S&W Model 29 and the .44 Magnum Ruger Blackhawks are still in production, and have been joined by numerous other makes and models of .44 Magnum revolvers and even a handful of semi-automatic models, the first being produced in the 1960s. The film Dirty Harry, prominently featuring the S&W M29, contributed to that model's popularity (as well as the cartridge itself). Ruger introduced its first long gun, a semi-automatic carbine called the Ruger Model 44 chambered for .44 Magnum, in 1959. Marlin followed soon after with the lever action Model 1894 in .44 Magnum. Having a carbine and a handgun chambered in the same caliber is an old tradition; the .44-40 Winchester was introduced by Winchester in a lever action in 1873, and Colt followed in 1878 with a revolver in the same caliber. The .38-40 Winchester and .32-20 Winchester were also available in both carbines and revolvers, allowing the shooter to use one type of ammunition for both firearms. Although improved modern alloys and manufacturing techniques have allowed even stronger cylinders to be made, leading to larger and more powerful cartridges such as the .454 Casull and .480 Ruger in revolvers the same size as a .44 Magnum, the .44 Magnum is still considered an exceptional weapon. In 2006, to commemorate the 50th anniversary of the .44 Magnum, Ruger introduced a special 50th anniversary Blackhawk revolver, in the "Flattop" style. The .44 Magnum delivers a large, heavy bullet with high velocity for a handgun. In its full-powered form, it produces so much recoil and muzzle blast that it is generally considered to be unsuitable for use as a police weapon. Rapid fire is difficult and strenuous on the user's hands, especially for shooters of smaller build or with small hands. Although marketed as a .44 caliber, the .44 Magnum and its parent .44 Special are actually .429-.430 caliber. The .44 designation is a carryover from the early measurements of "heeled" bullets, used in the later 19th century. In those times, bullets were measured on the outside of the cartridge, not the inside of the cartridge. After the .44 S&W Russian was developed, the forefather of the .44 Special and thus the .44 Magnum, the measurement of bullet caliber was taken from inside of the cartridge, resulting in .429 caliber. Instead of confusing buyers who were used to .44 caliber revolvers, the original .44 designation was kept for market recognition. Some gun styles are more comfortable to use when shooting this caliber. Many shooters find the rounded grip shape of the single action better for handling heavy recoil than the grip shape of double-action revolvers, which have a shoulder on top of the grip. Many shooters consider the ideal type of grip for heavy recoiling guns to be the longer "Bisley" style single action grip, and it can be found on single actions from Ruger (models marked "Bisley") and Freedom Arms, as well as many custom makers. The concept of a dual-purpose handgun/rifle cartridge has been popular since the Old West, with cartridges like the .44-40 Winchester, whose "high-speed" rifle loadings were precursors to magnum loads. Other dual-use rounds were the .32-20 Winchester and the .38-40 Winchester. Some past dual-purpose cartridges, like the .44-40 Winchester, gave their manufacturers trouble when people loaded the "high-speed" versions designed for rifles into handguns. Since the .44 Magnum was designed from the start as a revolver cartridge, there are no such issues, and SAAMI-compliant ammunition fires from any handguns or rifles chambered for the .44 Magnum. As a rifle or carbine cartridge the .44 Magnum is sufficiently powerful for medium-sized game, yet fits easily into a compact, lightweight package. In 1961, Ruger introduced their .44 carbine, the first .44 Magnum carbine. The lever-action Marlin Model 1894, and many other firearms are currently available in this caliber. With significantly longer barrels than revolvers and no cylinder gap (except in revolving rifles), carbines will generate a significantly higher velocity than a revolver loaded with the same ammunition. Tests with various ammunition in the Ruger Deerfield yielded a 100 yd (91 m) velocity of over 1,300 ft/s (400 m/s) with a 240-grain (16 g) bullet, comparable to the muzzle velocity out of a revolver. Loads using slow burning powders maximize performance in both short and long barrels, with one published load generating 1,500 ft/s (460 m/s) from a revolver, and 1,625 ft/s (495 m/s) from a carbine with a 240-grain (16 g) bullet. The .44 Magnum is well suited for game up to elk size. With precise shot placement and deep-penetrating cartridges, it has even been used to take the largest of game, including Cape Buffalo. Publisher Robert E. Petersen took a record-setting polar bear with a Smith & Wesson Model 29 .44 Magnum. It has even been used against elephants with success. In addition to beating the ballistics of the old .44-40 rifle loads, long considered a top deer cartridge, the heavy, flat-point bullets typically used in the .44 Magnum have an additional advantage. Tests performed where bullets are shot through light cover, intended to represent twigs and brush, have shown that the high-velocity, lightweight, thin-jacketed, pointed bullets used by most hunting cartridges today are easily deflected by contact with the brush. The ideal bullets for penetrating brush with minimal deflection are heavy, flat-point bullets at moderate velocities. The accuracy of the .44 Magnum is very good, with models from Colt, Smith & Wesson, and Ruger producing bullet groups of 3 to 4 inches (7.6 to 10.2 centimetres) at 50 yards (46 m), with most ammunition. The limiting factor of the .44 Magnum cartridge is not terminal ballistics. When fired from a 6 in (150 mm) revolver, a typically loaded .44 Magnum 240 gr (16 g) bullet will have more impact energy at 150 yd (140 m) than a 246 gr (15.9 g) .44 Special has at the muzzle, when fired from the same weapon. When loaded with a heavy, non-expanding bullet, the .44 Magnum will easily shoot through large game such as elk and even bison. The limiting factor is the bullet's trajectory: the best hunting bullets are heavy, so they are relatively slow. This means the projectile's trajectory will drop significantly at ranges beyond 100 yards (91 m); there will be virtually zero significant drop at 50 yd (46 m), so the gun's aimed "line of sight" can meet the "bullet's trajectory" at the same point. When drop-out at 100 yd (91 m) is about 2 inches (5.1 centimetres), the drop-out at 150 yards (140 m) is more than 8 inches (20 centimetres); with a 100 yd (91 m) zero drop-out, the drop-out at 150 yd (140 m) will still measure more than 6 inches (15 centimetres). Experts limit hunting ranges to 100 yards (91 m) when shooting .44 Magnum cartridges, less if practical accuracy requires it. The .44 Magnum remained mildly popular among shooters for many years after its introduction, but did not come to the attention of the general public until 1971, when it was prominently featured in the American feature film Dirty Harry starring Clint Eastwood. In one of the classic lines in cinema, titular character Harry Callahan describes his Smith & Wesson Model 29 as "the most powerful handgun in the world". Although not strictly true (the more powerful wildcat .454 Casull was announced in 1959), the .44 Magnum was the most powerful then in production. Demand for the Model 29 increased so much that they were selling for up to three times suggested retail price. When the Model 29 could not be obtained, customers sought other handguns chambered in this caliber, such as the Ruger Redhawk. ^ "DoubleTap". Archived from the original on 2009-07-31. Retrieved 2009-07-29. ^ "Buffalo Bore". Archived from the original on 2009-05-06. Retrieved 2009-05-04. ^ a b c Taffin, John. (September–October 2005). "The .44 Magnum: 50 years young!". American Handgunner. ^ a b c d e f Frank C. Barnes, ed. Stan Skinner (2003). Cartridges of the World, 10th Ed. Krause Publications. ISBN 978-0-87349-605-6. ^ a b Boddington, Craig. "The Fabulous .44 Mag". Guns & Ammo. Archived from the original on 2006-03-26. ^ Barnes, Frank C.; Skinner, Steve (2003). Cartridges of the World: 10th Edition, Revised and Expanded. Krause Publications. p. 528. ISBN 978-0-87349-605-6. ^ a b c Garry James (June 2005). "A Big 50 For The .44". Guns & Ammo. ^ Rick Hacker (July 21, 2011). "Smith & Wesson Model 29". ShootingIllustrated.com. ^ Supica, Jim; Nahas, Richard (2006). Standard Catalog of Smith & Wesson : 3rd Edition. Gun Digest Books. p. 162. ISBN 978-0-89689-293-4. ^ a b Bill Hamm (September 28, 2004). "Ruger Blackhawk .44 Magnum 'Flattop'". GunBlast.com. ^ a b Abraham Lincoln Artman Himmelwright (1908). The Pistol and Revolver. ^ Terry Riebling (November 1996). "Taking the Bite Out of the Mighty .44 Magnum". Performance Shooter. ^ Taylor, Chuck (1981). Complete Book Of Combat Handgunning. Boulder, CO: Paladin Press. p. 200. ISBN 978-0-87364-327-6. ^ John Taffin. "I LIKE SINGLE ACTIONS BECAUSE..." Sixguns.com. ^ Ballistics By The Inch .44 Magnum results. ^ a b c Chuck Hawks. "Woods and Brush Rifles". ^ Jamison, Rick (August 2000). "Ruger's All New .44 Deerfield". Shooting Times. Archived from the original on September 27, 2007. ^ Accurate Arms, 21.3 grains of #9 and an IMI 240 grain JHP bullet; see rifle[dead link] and handgun Archived 2008-11-20 at the Wayback Machine data. ^ JOHN TAFFIN. "TAFFIN TESTS: THE .44 MAGNUM". ^ Fryxell, Glen E. "The Bullets of SSK". Sixguns. John Taffin. Retrieved 2009-10-20. ^ GGG Staff (October 1997). ".44 Magnums: Accuracy Problems Plague the Model 29". Guns, Gear & Game. ^ PS Staff (July 1997). "Stock Silhouette Revolvers: Anaconda Versus Redhawk". Performance Shooter. ^ Patrick Sweeney. "Reloading the .44 Magnum". Guns & Ammo Handguns. Archived from the original on 2008-02-18. Retrieved 2008-02-21. ^ Chuck Hawks. "Handgun Hunting". ^ Goldberg, Jefferey (6 September 1993). "The Deadliest Gun in Town". New York Magazine: 32–34. ISSN 0028-7369. Wikimedia Commons has media related to .44 Remington Magnum.